The plantar fascia is a thick band of ligamentous tissue on the bottom of the foot connecting the heel to the ball of the foot. When the plantar fascia is stressed over time it can become weakened and damaged. Despite being called an “itis” plantar fasciitis is suspected to not be caused by an inflammatory process but instead by a gradual degeneration of the plantar fascia1. Platelet-rich plasma (PRP) can offers hope for people with plantar fasciitis as it can significantly reduce their pain and improve their mobility. The effectiveness of PRP is due to growth factors which are naturally present in platelets. The high concentration of platelets within PRP carry a large amount of growth factors. These growth factors are directly introduced to the site of injury during a PRP injection and jump-start the healing process. These growth factors include platelet-derived growth factor (PDGF), transforming growth factor beta (TGF)-β, insulin-like growth factor (IGF), epidermal growth factor (EGF) and vascular endothelial growth factor (VEGF)2. The research clearly shows that PRP has a beneficial effect on plantar fasciitis. In total 20 studies have been performed on PRP for plantar fasciitis. All 20 of these studies have found that people being treated with PRP have significant improvements in the pain associated with their plantar fasciitis3-22. In the 9 studies comparing PRP treatment to corticosteroid injections 6 of these studies found that PRP was a superior treatment3-8, 1 of these studies found PRP to be as good or better9 and and 2 of these studies found that PRP was equally as good as a corticosteroid injection10,11. Vahdatpour 20163 Superior to cortisone "… Because of this long-term effect of PRP, its use is more preferred than corticosteroid in plantar fasciitis." Jain 20154 Superior to cortisone "At 12 months, PRP is significantly more effective than Steroid, making it better and more durable than cortisone injection." Say 20145 Superior to cortisone "The application of PRP appears to be more effective than steroid injection in terms of pain and functional results in the treatment of chronic plantar fasciitis." Shetty 20146 Superior to cortisone "Our study confirms that there is significant clinical improvement in PRP group at three months after the injection." Monto 20147 Superior to cortisone "PRP was more effective and durable than cortisone injection for the treatment of chronic recalcitrant cases of plantar fasciitis." Tiwari 20138 Superior to cortisone "The results at the 1, 3 & 6 months were evaluated, which showed the good results with platelet rich plasma in comparison to steroid injections." Mahindra 20169 As or more effective "Platelet-rich plasma injection is as effective as or more effective than corticosteroid injection in treating chronic plantar fasciitis." Acosta-Olivo 201610 Equally effective "… PRP demonstrates an efficacy equal to that of steroids." Akşahin 201211 Equally effective "PRP injection seems to be safer and at least having same effectivity in the treatment of plantar fasciitis." The favourability of PRP over corticosteroid injections has also been noted because of the possible adverse effects of corticosteroid injections including adverse structural tendon changes, heel fat pad degeneration and, most worryingly, plantar fascia rupture23,24. PRP is prepared by collecting and centrifuging a sample of a person’s own blood on the day of treatment. PRP is not stored for later use as new blood can easily be collected prior to treatment ensuring maximum safety. The centrifuging process rotates the blood rapidly causing the components of the blood to separate according to their weight. Platelets, being a different weight than other blood components, separate into their own layer separate from the lower red blood cell layer and higher plasma layer. These platelets are the part of the blood which is collected and used for injection. Some people who receive PRP treatment for plantar fasciitis may have additional discomfort after the injection for a day or two. Improvement may be seen in the pain and disability associated with plantar fasciitis within the first few weeks. Although improvement often can be seen after one injection two or three injections typically yield optimal results. PRP is exceptionally safe because it simply uses a component of the blood of the person being treated. The risk of allergy or other reactions are essentially absent as a result. The studies which have investigated PRP have also found an excellent safety profile25. Lemont H, Ammirati KM, Usen N. Plantar fasciitis: a degenerative process (fasciosis) without inflammation. J Am Podiatr Med Assoc. 2003 May-Jun;93(3):234-7. Vahdatpour B, Kianimehr L, Moradi A, Haghighat S. Beneficial effects of platelet-rich plasma on improvement of pain severity and physical disability in patients with plantar fasciitis: A randomized trial. Adv Biomed Res. 2016 Nov 28;5:179. Jain K, Murphy PN, Clough TM. Platelet rich plasma versus corticosteroid injection for plantar fasciitis: A comparative study. Foot (Edinb). 2015 Dec;25(4):235-7. Say F, Gürler D, İnkaya E, Bülbül M. Comparison of platelet-rich plasma and steroid injection in the treatment of plantar fasciitis. Acta Orthop Traumatol Turc. 2014;48(6):667-72. Shetty VD, Dhillon M, Hegde C, Jagtap P, Shetty S. A study to compare the efficacy of corticosteroid therapy with platelet-rich plasma therapy in recalcitrant plantar fasciitis: a preliminary report. Foot Ankle Surg. 2014 Mar;20(1):10-3. Monto RR. Platelet-rich plasma efficacy versus corticosteroid injection treatment for chronic severe plantar fasciitis. Foot Ankle Int. 2014 Apr;35(4):313-8. Tiwari M, Bhargava R. Platelet rich plasma therapy: A comparative effective therapy with promising results in plantar fasciitis. 2013 Mar;4(1):31-5. J Clin Orthop Trauma. Mahindra P, Yamin M, Selhi HS, Singla S, Soni A. Chronic Plantar Fasciitis: Effect of Platelet-Rich Plasma, Corticosteroid, and Placebo. Orthopedics. 2016 Mar-Apr;39(2):e285-9. Acosta-Olivo C, Elizondo-Rodriguez J, Lopez-Cavazos R, Vilchez-Cavazos F, Simental-Mendia M, Mendoza-Lemus O. Plantar fasciitis. A comparison of treatment with intralesional steroids versus platelet-rich plasma (PRP). A randomized, blinded study. J Am Podiatr Med Assoc. 2016 Oct 11. Akşahin E, Doğruyol D, Yüksel HY, Hapa O, Doğan O, Celebi L, Biçimoğlu A. 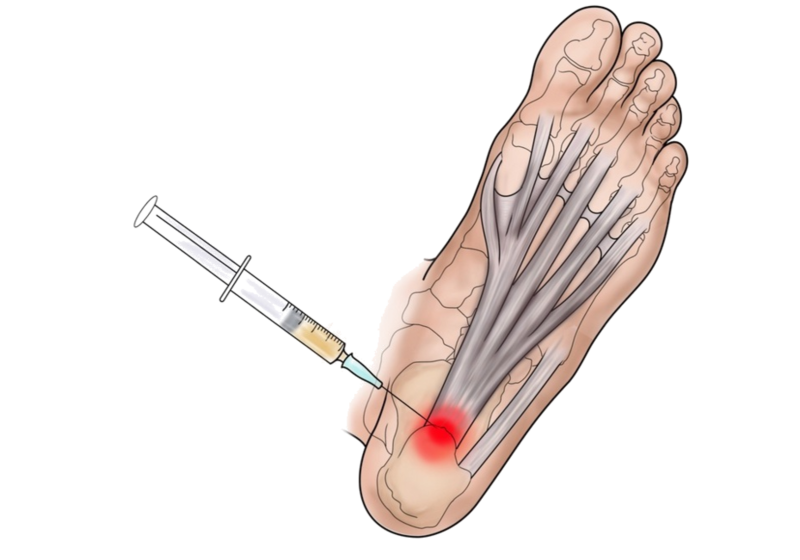 The comparison of the effect of corticosteroids and platelet-rich plasma (PRP) for the treatment of plantar fasciitis. Arch Orthop Trauma Surg. 2012 Jun;132(6):781-5. Chew KT, Leong D, Lin CY, Lim KK, Tan B. Comparison of autologous conditioned plasma injection, extracorporeal shockwave therapy, and conventional treatment for plantar fasciitis: a randomized trial. PM R. 2013 Dec;5(12):1035-43. Kim E, Lee JH. Autologous platelet-rich plasma versus dextrose prolotherapy for the treatment of chronic recalcitrant plantar fasciitis. PM R. 2014 Feb;6(2):152-8. Martinelli N1, Marinozzi A, Carnì S, Trovato U, Bianchi A, Denaro V. Platelet-rich plasma injections for chronic plantar fasciitis. Int Orthop. 2013 May;37(5):839-42.
van Egmond JC, Breugem SJ, Driessen M, Bruijn DJ. Platelet-Rich-Plasma injection seems to be effective in treatment of plantar fasciitis: a case series. Acta Orthop Belg. 2015 Jun;81(2):315-20. Vahdatpour B, Kianimehr L, Ahrar MH. Autologous platelet-rich plasma compared with whole blood for the treatment of chronic plantar fasciitis; a comparative clinical trial. Adv Biomed Res. 2016 May 11;5:84. Gogna P, Gaba S, Mukhopadhyay R, Gupta R, Rohilla R, Yadav L. Foot (Edinb). Plantar fasciitis: A randomized comparative study of platelet rich plasma and low dose radiation in sportspersons. 2016 Aug;28:16-19. O’Malley MJ, Vosseller JT, Gu Y. Successful use of platelet-rich plasma for chronic plantar fasciitis. HSS J. 2013 Jul;9(2):129-33. Wilson JJ, Lee KS, Miller AT, Wang S. Platelet-rich plasma for the treatment of chronic plantar fasciopathy in adults: a case series. Foot Ankle Spec. 2014 Feb;7(1):61-7. Kumar V, Millar T, Murphy PN, Clough T. The treatment of intractable plantar fasciitis with platelet-rich plasma injection. Foot (Edinb). 2013 Jun-Sep;23(2-3):74-7. Ragab EM, Othman AM. Platelets rich plasma for treatment of chronic plantar fasciitis. Arch Orthop Trauma Surg. 2012 Aug;132(8):1065-70. López-Gavito E, Gómez-Carlín LA, Parra-Téllez P, Vázquez-Escamilla J. [Platelet-rich plasma for managing calcaneus tendon tendinopathy and plantar fasciitis]. [Article in Spanish]. Acta Ortop Mex. 2011 Nov-Dec;25(6):380-5. Acevedo JI and Beskin JL. Complications of plantar fascia rupture associated with corticosteroid injection. Foot Ankle Int 1998 ; 19 : 91-97. Cole C, Seto C and Gazewood J. Plantar fasciitis : evidence-based review of diagnosis and therapy. Am Fam Physician 2005 ; 72 : 2237-2242. Andia I, Maffulli N. Biological Therapies in Regenerative Sports Medicine. Sports Med. 2016 Sep 28.